Acoustic Energy returns with versatile Aego 3 system | What Hi-Fi? New for 2016 from Acoustic Energy, the Aego 3 is available as a soundbar and subwoofer system or as two small speakers and sub, both complete with wireless connectivity. Acoustic Energy is a famous British audio brand that has been relatively quiet of late but following on the from the 101 hi-fi speakers last year comes the new Aego 3 system. And we got a first sneak peek of the system at CES 2016. The Aego 3 continues the work of the Aego M and Aego 2, launching in a choice of two set-ups: a soundbar and sub, or two satellite speakers and sub. Small speakers come with a small price - it's just £199 for either combination, and AE is confident the sound does the company's name justice. All the power and amplification is found in the large subwoofer, with connections coming in the form of analogue, optical digital and wireless aptX Bluetooth. 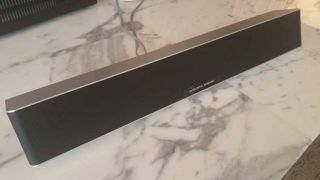 The speakers have an alloy-bodied design, giving them a solid, substantial feel, and while the speakers are happy to sit pretty much anywhere, the soundbar will be most happy under or above a TV. It can be wall-mounted, too. Being previewed behind closed doors at CES 2016, the Aego 3 will get an official public launch at the Bristol Sound & Vision Show in February.